Imagine a world where you could spend your days cuddling adorable fluffy kittens. 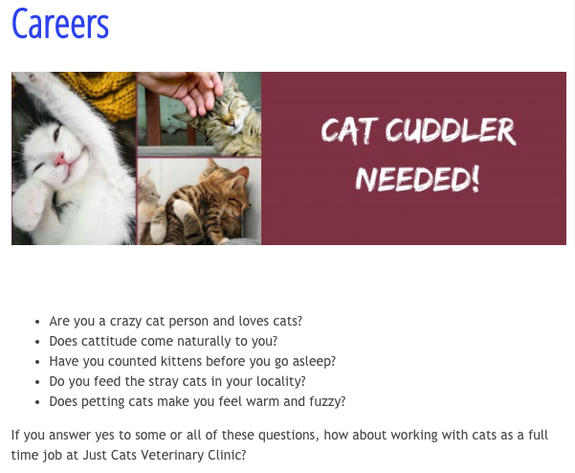 A Dublin-based veterinary clinic is making that dream a reality as they're advertising a "cat cuddler" role. It sounds like the best job in the world. Just Cats veterinary clinic in Clonsilla, Dublin, is looking for a "crazy cat person" who "loves cats". Among other requirements includes "cattitude" — whatever that means. The ideal candidate will have a track record of feeding stray cats in your locality and they'll feel "warm and fuzzy" when they pet cats. You'll also need to be "softly spoke" and "capable of cat whispering" to calm the nerves of more nervous cats. Kittens with frog hat, green background. Cat in the crown isolated on ? white background. Gatito con 15 dias de vida posando con gorrito. Persian kitten under over sized hat on white sheet. Long-haired cat in bowl with soft hat including Japanese flag. You'll also need to possess the rare skill of understanding different types of purring. And, on top of all that? You'll also need a qualification recognised by the veterinary council of Ireland. 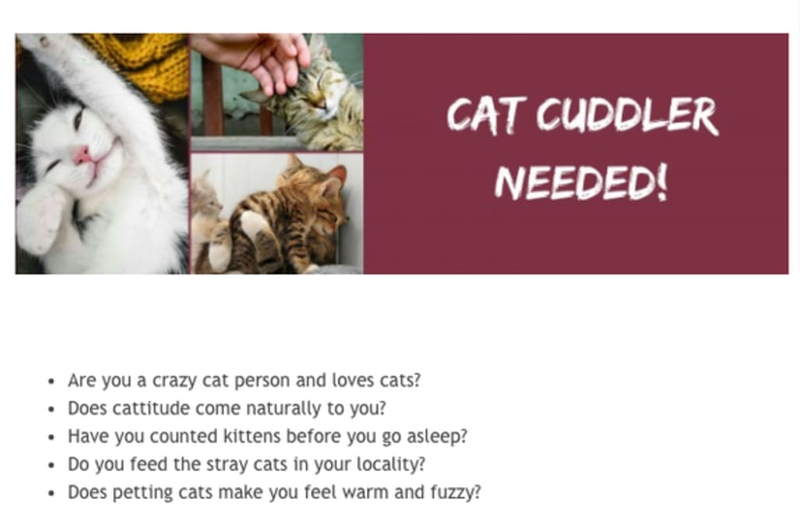 Wannabe cat cuddlers can apply by sending CVs and cover letters to miaow@justcats.ie.